“Sopranos” Ends Tonight–What’s the Big Deal? There’s a lot of pop culture chatter throughout the media over tonight’s series finale of HBO’s “The Sopranos,” about the mob family of Tony Soprano and friends (and rats). I never got into the show. First, I don’t subscribe to HBO, and second, one of the episodes I saw involved some guy named Ralph or Ralphie being beaten to death, dismembered, and then his head in a bowling bag being buried. It turned my stomach, and I found it to be violence for no reason, coupled with a boring plot concerning people about whom I cared nothing. They reminded me too much of some of the other people I had in the back seat of the cab. If I want to see Italians acting badly I didn’t mind the HBO series ‘Rome’. They slaved over every frame in that series. The collegiums of ‘Rome’ I guess were where the Sopranos learned to be the Sopranos. If anyone liked ‘I, Claudius’ back in the ’70’s you will very much like ‘Rome’. There’s a lot I miss the first time around, perhaps I’ll catch ‘The Sopranos’ in syndication. Oh, almost forgot, what ever happened to that short lived series ‘The Black Irish’? I liked that. Sheer fantasy, Irish don’t act like that in real life. Grade A stuff. I’m unutosqienably in your debt. I love The Sopranos. The Godfather was about the old way of doing things among the Sicilians. This is about the modern mob with it’s supposed traditions but lack of anyone who really is loyal to them anymore. Ralph Cifaretto, the character you mentioned, was a piece of garbage who killed an innocent woman in a rage. Tony Soprano is the boss of the DiMeo family in the show and when he found out about Ralphie also killing a horse for insurance, he went nuts and strangled him to death after Ralphie hit him. In mob law, you never hit a made man and especially the boss or you have to go. It’s how the mob really is today and it’s interesting. The Departed is about the Irish crime families. They aren’t the mob and can’t hold a finger to the Italian mob. My great grandfather was a mobster from Italy. I don’t support the mob but know they are the real deal, not the Russians or the Irish crime families. It’s a good show about a mobster’s being torn between leading The Family and his own family. I can’t wait to see the finale. Tony didn’t kill Cifareto because of the stripper- he killed him because Cifareto killed a racehorse that Tony had grown attached to. 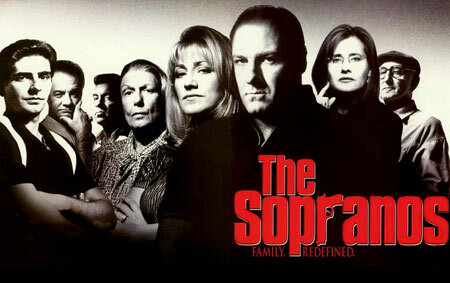 Yes- I confess I am a Sopranos junkie. It is kind of sad when the only thing Americans care about is what is on television! I understand. It’s the same kind of empty yet human romanticism that leads to stripper bars, the canonical Church of Rome and Pope, modern belief in idols — like all the beautifully, expensively, dressed and maintained Mary or Baby Jesus dolls in niches throughout Mexico set in what are otherwise conditions of total squalor. Violent criminals are, being violent and crude, not able to be accurately portrayed in play-acting, film, video, theater. People would never be able to watch it. Many people tune out — go blank during — situations of such violence and cruelty as are found in the real criminal gangs. It is shockingly overwhelming — and should be — to most normal people. The same tune-out effect would preclude any ability to accurately portray it. Cloak it in myth, mythos, ritual — it is palatable to the psyche then. Narrow the vision, put on blinders. But empty and false at the same time. Maybe excepting Pacino’s Scarface, Coppolla’s Godfather III. Tonight is the final curtain call for this soprano. A dead soprano is justice served, but not sought. But a live soprano to go on singing is what we’d wish for a friend and who does not consider Tony a friend. How can any Greek tragedy end except in death. Good bye, Tony. The Sopranos is what it is… entertainment. Granted, based on your opinion it may be good or bad entertainment, and your either a fan or not. A movie about a bunch of gang/mafia members is not going to be pretty, the Sopranos shows mafia life for what it is. If you don’t like people getting kiled, sexuality, or violence, go watch Shrek I,II,III. I think the Sopranos does a good job depicting the mob lifestyle and that is probably one of many reasons why it has done so well as a program. The Sopranos is able to balance the grim side of being in the mob, with the reality emotional aspects of belonging to the mafia. It another side of society that exists and is a reality and the Sopranos brings that reality to our television screens. OOPS! THANKS. CORRECTED. I DON’T KNOW ITALIAN, THAT’S FOR SURE. kdawg82, coincidentially the History Channel about two hours ago finished with a history of the Mafia/Costra Nostra tracing its history back to Sicily back in the 1890’s. It was two hours long. There’s no difference between all the crime groups regardless of their ethnicity, none. There were interviews with all the living law enforcement officials that put them away including Guilliani and Governor Cuomo. You’d think they (the mob) took lessons from the koranimal koloring book. But, then Sicily is right across the sea from where the Barbary Pirates lived and the show mentioned that one of the occupiers of Sicily’s past where the Arabs. Maybe the History Channel will run it again this week. At 4.01 I left a comment asking about a show. I think I gave it the wrong name, I think I meant to say ‘The Black Donnelly’s’. Is that coming back or what? Debbie, don’t worry about it. I wouldn’t pay for t.v. any more than I’d pay for a disease. I like American Idol, though. I have all 6 seasons on DVD, but only because I’m never home and I don’t have cable. It’s one of the better shows I’ve seen, but that isn’t saying much. I don’t know how people can call it a “masterpiece”. James Gandolfini’s New Jersey accent is comical, and his character’s recurring introspection gets pretty tedious. A lot of the “atmosphere” is overdone, I got VERY tired of listening to Tony eat and breathe through his nose! The show doesn’t give the audience enough credit, the characters keep reminding us of how powerful they are. Sometimes it’s hard to believe they are in charge of anything, much less New Jersey or New York. Some of the plots meander and end, and characters disappear just when it was getting interesting (what happened to the Russian special forces guy who ran off when they tried to dump his body in south Jersey??). But other times it’s compelling, gripping, and pretty funny. Some of the characters are complete classics. Once you get drawn in, you have to find out what happens next. Overall it’s entertaining, I would buy it again. LAME LAME LAME…Did I say LAME? Its not over. At least Tony and AJ will be back. The O/U is 5 years. Dee takes the UNDER for a dime, Alex. Gotta go now. JOHN FROM CINCINNATI is MUST SEE tee vee. BIG LOVE & WEEDS?? What a waste of a HDTV. We’re gonna have to read EverVigilantSheepdog posts for entertainment this summer? That’s an ENDER. Ditto…the long awaited conclusion sucked. Congratulations! You win the prize for most useless comment meant only to provoke! S-OPS: I hope you’re being sarcastic; if not, then you haven’t been in the USA long: I think that popular culture in this country is infatuated with the mob and mobsters. We’re not blushing and “going blank”. Hell, we’re not only accurately portraying the violence and cruelty, we’re begging for more. I’m sure most Sopranos viewers were hoping that Tony would get to wear a cement overcoat in that last episode. From the comments above, I’d say fans of the show were disappointed with the way it ended; and likely because there wasn’t enough blood and gore. This show died several seasons ago when it got too weird. Good riddance…..
That’s OK though, this makes room for the best show on TV: The Wire. Buy the previous seasons on DVD and watch their finale. All you 1811’s will recognize some characters.